Friday again! Random Five again! 1.) Remember last week I mentioned that I was missing Bride and Groom Swans? They must have gotten word, because they were here to visit on Tuesday. 2.) And the swans weren’t the only wildlife to visit at sunset this week. 3.) It’s been a friend-filled week. Wednesday, I had lunch with two friends, then yesterday, I spent the afternoon with my cousin/friend, Betty, looking over old family letters and newspaper clippings and sharing our memories of loved ones. 4.) Folks in our area certainly can’t complain about being bored with the weather. Recently, we’ve had thunderstorms, a tornado, foggy mornings, five snowflakes, cool temps, warm temps and crystal clear days. More randomness over at Nancy’s “A Rural Journal“. This entry was posted in Days at Home, Family, Sunrises/Sunsets, The Swans and tagged black swan, deer, old boat, photo backup, random five friday, snowflake, thunderstorm, tornado, white swan. Bookmark the permalink. I know you’ve missed the bride and groom – nice to know they’re doing well and remembering where the best bread handout can be found! Pretty photo of the marina on a clear day…..and I know how much you enjoy keeping up with all the family down there – bet that was a FUN day!!! Hope your Friday is also fun-filled! I would LOVE to know how many photos. That sailboat sitting in the slip on the water like glass is a pretty click Dianna! The reflection!!! I am glad Bride and Groom Swan are back, I was thinking maybe the eagles were keeping them away. Your weather sounds a bit like MissouREE weather! Good Morning! Enjoy your Friday!! The pictures are all gorgeous. 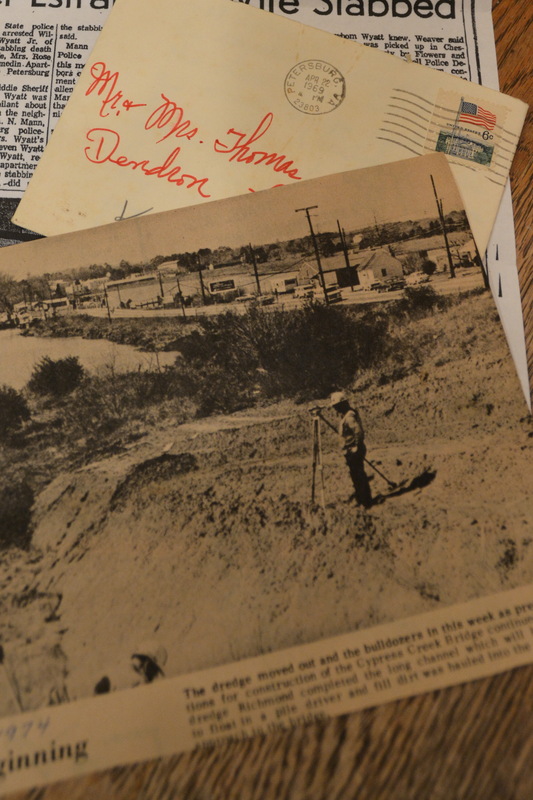 Tried to enlarge the newspaper photo so I could see what all the construction was but couldn’t do it! Sounds like you and Betty had a lot of fun. How wonderful Bride and Groom swan paid a visit. You have had a friend filled week! And 5 snowflakes, too…you’re funny. Love that photo of the deer! We often have them in our yard,but usually at night. I have never managed to get a decent photo. I really need to back up my photos. It hurts to think of what I’d lose if my computer crashed. Great Random 5 and it is nice to see the Bride and Groom swans! Another great 5 here; really glad to see bride & groom back ! Such a fun 5! A ‘friend-filled’ week is the best kind. And as for the number of photos … I’ll bet we could get quite a contest going here online with that one! 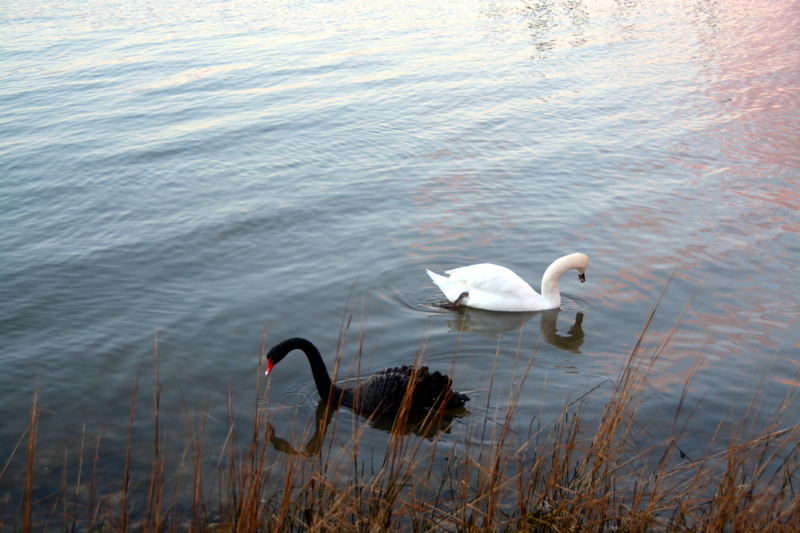 I love seeing the Bride & Groom Swans. They make me smile. 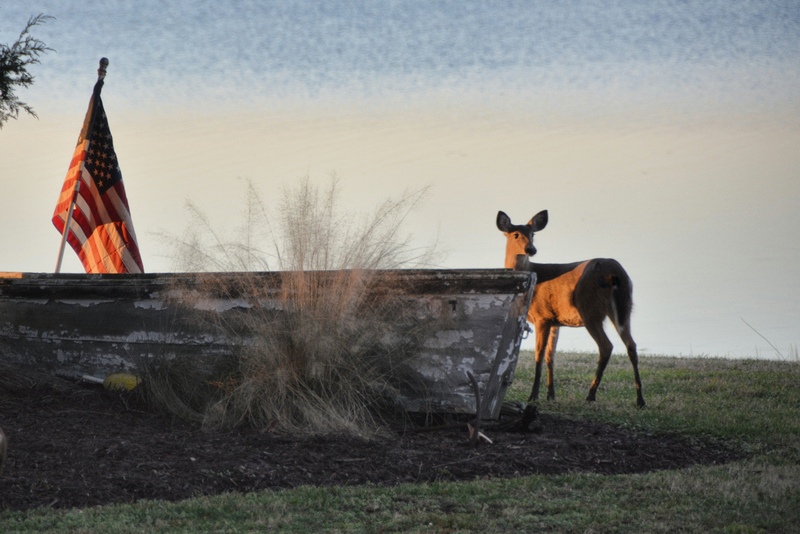 Your deer photo by the boat and flag is awesome. I can’t get over that stunning blue mirror water, it’s so serene. Love all your thoughts & photos. But I’d like to add that I think you have a gift for capturing the perfect moment. I think you could go professional with your photography. Hey you already been published and that’s a big step. 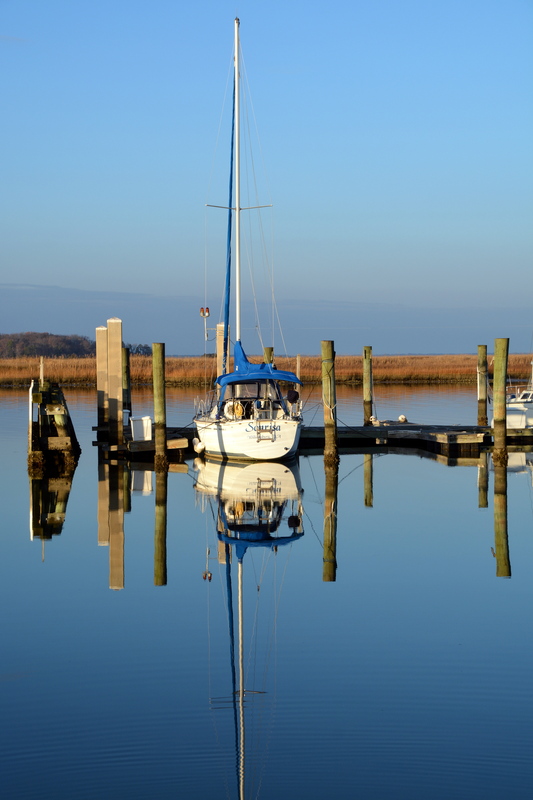 The crystal clear vision of the boat and reflection is a photo worth framing! That is an amazing photo of the boat on the water. We definitely have weather to suit everyone–for a minute or two, anyway. The deer is so pretty posed there, and it’s good to see the swans got the message and returned. I imagine it was a LOT of photos, and I’m glad you got them backed up! 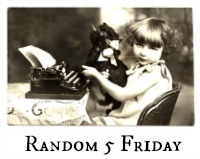 It’s really fun reading your random fives on Fridays. Like many of your other commenters, I think the photo of the boat is absolutely beautiful! Five snowflakes, huh? Well, remember how I said our snow was all gone? Surprise, it’s back! Hubby and I were out running errands last night and were caught in a blinding snowstorm. How lucky you are to have both swans and deer where you can enjoy them. And, yes, I can sure relate to the weather… the same here but then we don’t live but about 30 minutes apart, do we? So, naturally the weather is gonna be about the same. Have a great weekend. So glad to hear your yard friends are back. The picture of the boat is beautiful. I find such fun and memories in talking with family and going through family things. My guess is.., 3,000.00+. The swans are beautiful. I’m glad they are back. I continue to be awed by the wildlife by your house. So happy to see ‘bride and groom’ … was thinking about them just the other day (no joke!) hoping they were ok! I adore the photo with that pristine reflection. And I’ve done that photo to hard drive thing…so, since you’re a bit like me, the number is way into the thousands!